Although very little is known of the life of Lacon, besides the fact he worked in Bath, one can tell from his few surviving works that he was a highly skilled painter. Bath during the mid-eighteenth century was experiencing an ever-increasing influx of wealthy individuals who visited the city to use the spas and to drink the water, which they believed were capable of curing a wide range of illnesses. Many artists were working in Bath during this period of prosperity, most notably perhaps William Hoare (c.1707-1792) whose delicate pastels remained in high demand up until the arrival of Gainsborough in the city in 1759. What is fascinating about Lacon is that his entrepreneurial prowess reached further than just the promotion of his skills as a painter of portrait miniatures. It appears that the artist also played a key role in the emerging entertainment industry in Bath, and established, according to Vertue, a fashionable puppet-show. Curiously, recorded in the proceedings of a Bath historical society in 1897, it is suggested that Lacon perhaps also worked in the medium of wax . The basis of this assumption is not known, but it certainly would correspond with the artist’s trade as a puppeteer. 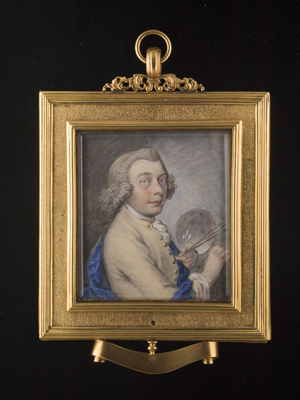 Here, Lacon fits the mould of the gentleman ‘limner’ of the mid eighteenth century, as a talented multi-faceted practitioner of the arts, much in the guise of Bernard Lens III (1682-1740), who also worked as a drawing master, curator, framer and restorer. ‘Given [to] me by the ingenious Artist himself/ Mr John Lacon’ - April 26th 1755. Lacon is seen here with the tools of his painting trade and one can gauge therefore on a more personal level, the pride which he took in his art. Proceedings of the Bath Natural History Antiquarian Club Field, vol.8, p.215, 1897.